Hobbies: Owns over 190 cars! 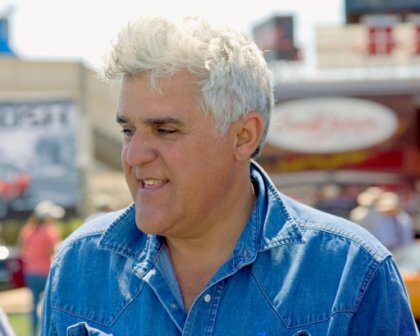 Jay Leno has been the host of the Tonight Show on the American CBS network since 1992, with just a short absence in 2009-2010. Given his brilliant monologues and natural gift for storytelling and joke making, you may be surprised to learn that Leno struggled with dyslexia during his school years. While growing up in Andover, Massachusetts, in the 1950s and ‘60s Leno had problems completing his homework but was helped by his mother, a first generation Scottish immigrant. Helped by his mother and inspired by his teachers, Leno pursued his natural talent for telling jokes and stories. At one point, his high school guidance counselor actually recommended that he drop out of school, but he perservered with his studies and was later admitted to Emerson College in Boston, graduating in 1973 with a Bachelor of Arts degree in speech therapy, a significant accomplishment itself! While still in school in Boston, Leno performed stand-up comedy in local night clubs. Later he moved to Los Angeles to pursue his dreams of working in comedy full time. First appearing on the Johnny Carson show in 1977 he would go on to take over the show in 1992. Leno has also appeared in many movies including The Flintstones and the animated Cars in which he played the voice of 'Jay Limo'. "I had wonderful teachers. I would not be in show business without them. I remember Mrs. Hawke, my English teacher, who said to me, ‘You know, you’re always telling jokes in the hall, why don’t you write some of those stories down and maybe you can tell them to the class?’ It would have never occurred to me to do that, because that just seemed like homework. And for the first time in my life, homework was actually enjoyable."